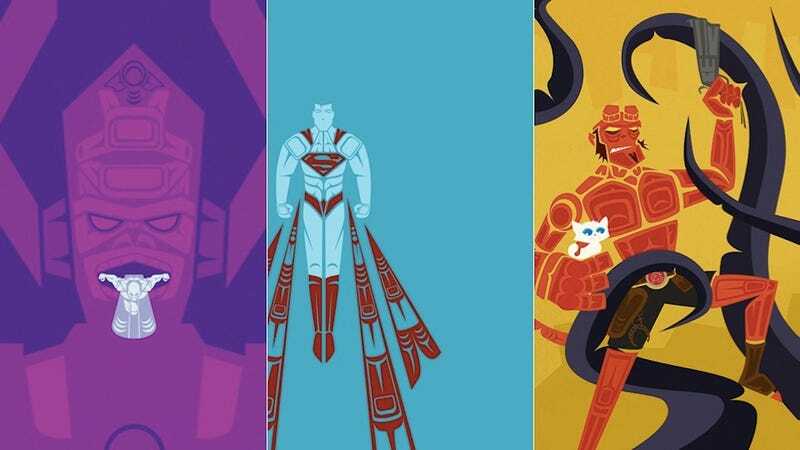 Jeffrey Veregge is a designer and artist who studied traditional coastal Salish art after growing up on a reservation in the American pacific northwest. A member of the Port Gamble S'Klallam Tribe, I was raised and spent a majority of my life on our reservation known locally as Little Boston, which is located near Kingston, Washington. Although I am enrolled there, I am also both of Suquamish and Duwamish tribal ancestry. I am a honor graduate from the Art Institute of Seattle, and I have had the privilege to study with Tsimshian master carver David Boxley for a short time learning the basics of Salish form-line design . . . [My work] is a reflection of a lifetime love affair with comic books, toys, TV and film. Taking my passions and blending them with my Native perspective. I love how well these comic book characters translate into traditional art. See more of Jeffrey Veregge's work on his website.